The theme of EQUITY of EVIL – based on true medical events from the late 70’s – becomes REALITY!! As discussed in prior blogs, EQUITY of EVIL is based on a series of true events in which harvested organs from aborted fetuses were grown for experimental purposes. This author made the link to a real business plan that suggested ‘mobile abortion units’ be established to optimize safer and cleaner procedures in remote, impoverished areas throughout the world. The result: evil-doers were stealing the intact aborted remains in order to use their organs to compete in the multi-billion illicit black-market of organ transplants. For a more indepth look into this dark world and the realm of possibilities facing our society, read EQUITY of EVIL – before you see the movie! The screenplay is underway!! Although I was very concerned about the abortion theme encased within this debut novel, I’ve been pleased with the amount of positive correspondences from supports on both sides of the table (Pro-Life and Pro-Choice). This validated my goal of being objective as possible in dealing with this delicate subject. This story provides a true reconstruction of my personal experiences as a pre-med student, tasked with the dissection of aborted fetuses for the scientific purpose of learning how to potentially diagnose and treat a rare abnormality that was known to create uterine cancer. As a by-product of this mini-autopsies in the Human Genetic Engineering Department, I was also required to harvest and grow their tiny organs with hopes of providing fundamental knowledge that might someday help optimize tissue and organ transplants. That was back in the ’70s and I only dare speak of it today. Decades later, as a Venture Capitalist dedicating funds to supporting new medical technology innovations, I was provided a Business Plan that suggested a new business model for one of the most prevalent medical procedures in the world – Abortion. This Plan told of “Mobile Abortion Units” that would roll into various neighborhoods throughout the world, to perform walk-on abortion procedures using the most state-of-the-art equipment and sterile procedures. Well… you’re going to have to read the book to experience the evil consequences of such a proposal, but the concept of determining how to provide alternative access to these procedures is something our world will have to figure out. There was a very informative article in the January Issue of Bloomberg BusinessWeek entitled, “Regulating Away Abortion“. Again, I’m not providing this information to support either side of the abortion debate, but I’m a realist who accepts that fact that abortion is not going to go away in our lifetime. If this procedure is not made available to women, they will simply find alternative means to rid themselves of unwanted pregnancies. I’m offering this information for the sake of humanity and decency. In the novel, EQUITY of EVIL, aborted fetuses are extracted and maintained in a special fluid-filled canister to preserve them for the harvesting of their organs. The story includes a business and legal debate over the legal jurisdiction of how the fetal remains from an abortion are properly dealt with. The Bloomberg article describes Senate Bill No. 54 which requires the fetal remains to be cremated or buried… with non-compliance a felony of law punishable by up to three years imprisonment or a fine up to $5000, or both. Such disposal comes with an average cost of approximately $250 per remains, which nearly doubles the price of most abortions. Instead of banning abortion outright, many State law makers are creating such mandates in order to simply make it too expensive for providers to remain in business. Other state laws require providers to be licensed as freestanding surgical outpatient facilities and to carry additional personal liability insurance coverage of at least $1.0 Million – such licensing, renovation and insurance costs have forced many facilities to close their doors. Since 2008, the number of providers, including doctors’ offices and special clinics, have fallen nearly 38% for the peak in 1982. Federal data reveals that abortion is one of the safest medical procedures in the U.S. with less risk of death than getting a shot of penicillin and 14-times safer than carrying a pregnancy to delivery. Regulations which cause delay and increase the costs of this procedure, only drive up the risks. A read of EQUITY of EVIL may give you another perspective, regardless of your position on this topic. I welcome your comments and opinions. With an endorsement on the front cover by International Best-selling Author, Dr. Robin Cook, the bold new novel, EQUITY of EVIL, has leapt to the top of the Amazon charts of Medical Thrillers based on Average Customer Reviews. Three literary awards, including the 2012 Global eBook Award for Best Suspense Thriller, further enhanced the brand recognition of this new author. To meet the demands of our growing fan base, we quickly followed with the release of this second novel, EQUITY of FEAR that promises the same suspense, intensity and international intrigue. 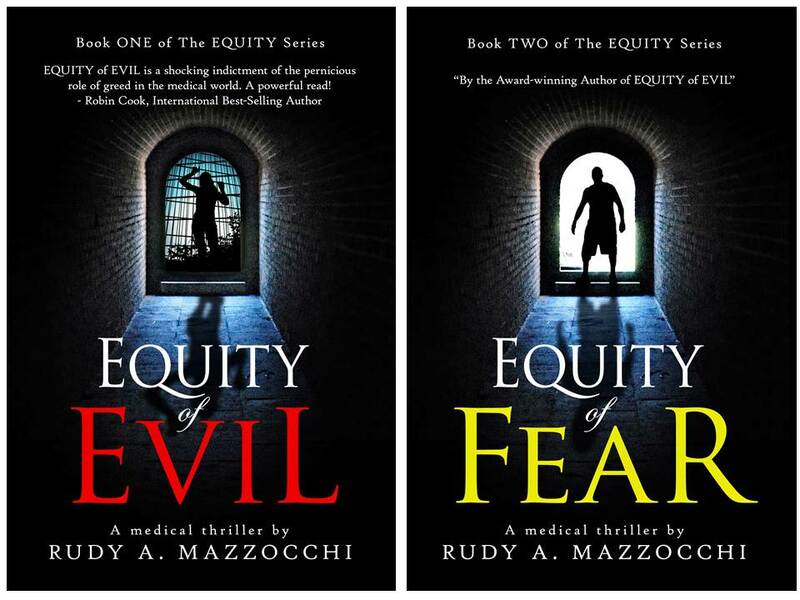 EQUITY of EVIL and EQUITY of FEAR are the 1st and 2nd Books in a new trilogy called The EQUITY Series. The heroic main character, Roman Citrano, boldly navigates the reader through these controversial thrillers that combine both business and medical science based on true events and/or current technologies under development behind closed laboratory doors throughout the world. Thanks for all your continued support! I intend to post several new EQUITY of FEAR related blogs here soon, regarding current technologies designed to “rewire the brain”. The eBook version of EQUITY of FEAR was released on March 25th and we’ve had a tremendous reception to this 2nd book in The EQUITY Series. There’s a great deal of promotional work ahead, but the following represents the initial reviews, interviews and guest blogs associated with the “launch”. A bit overwhelming, but the first review provides a wonderful summary. 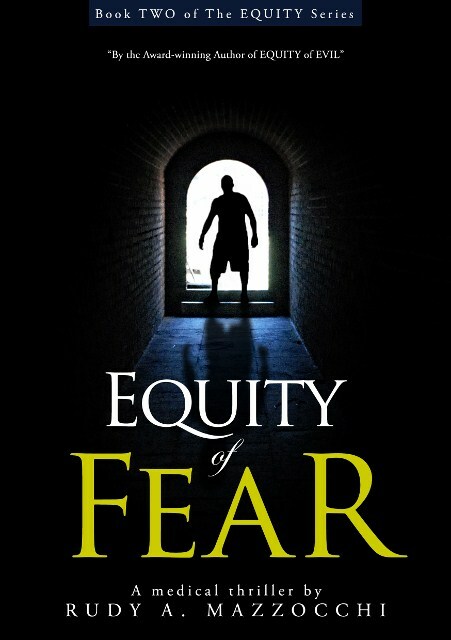 The Second Book in The EQUITY Series, EQUITY of FEAR, is now available on various sites, including AMAZON (http://amzn.to/16bDUfY) and Barnes & Noble (http://bit.ly/WPJEcC). This second book is not a sequel to the first, but carries a similar theme with new characters in a different foreign country. However, our main character from EQUITY of EVIL, Roman Citrano, plays an important supporting role to our new C.E.O., Frank Moretti. A synopsis can be found here on our website: ttp://www.rudymazzocchi.com/ABOUT_RUDY.html. More soon on this exciting technology known as NEUROPLASTICITY – The re-wiring of the Brain! We are pleased to announce the release of EQUITY of FEAR, the eBook to be available the week of March 25, 2013, with print versions in July. This also coincides with the new cover design of both EQUITY of EVIL; www.rudymazzocchi.com. A synopsis of both novels can be found on this site as well. The following is a link to the first of many REVIEWS of EQUITY of FEAR; http://www.inrandom.com/2013/02/2nd-book-in-equity-series-equity-of.html. This continues with the general theme of The EQUITY Series and discloses the exciting medical innovations associated with “neuroplasticity” – the re-wiring of the brain. Altering the functional areas of the human brain is already being accomplished in several countries, including clinics and research institutions throughout the U.S.. What would individuals pay to have a non-invasive therapy to eliminate or restore specific memories, or perhaps eliminate fear? EQUITY of FEAR is a suspenseful thriller that will pull you into another dark world where torture and pain become just another set of data points, and lives are discarded for the sake of owning the ability to control how man perceives and processes fear. I look forward to seeing your comments and reviews over the coming year! Eliminating the Right to Choose? Be Careful What you Wish For! In researching and writing the initial manuscript of EQUITY of EVIL, I didn’t hesitate to use the theme of abortion and human trafficking as the backdrop for this debut suspense novel. However, what struck me as very odd was that abortion has been practiced and debated long before we had the religious beliefs and laws that we now have in place. These are ancient, historical practices that have been discussed and written about centuries before Christ. So why hasn’t mankind come to any universal conclusions regarding the moral, ethical and political position on this topic? I’m not asking why we haven’t resolved the issue; I’m asking why people and nations haven’t come to a final conclusion that will definitely determine whether it is right or wrong… to at least put an end to the debate. Fact: Abortion is not going to “go away” by declaring it legal or illegal. So here we are in the year 2012 with presidential candidates talking about overturning a landmark decision made by our Supreme Court (i.e. Roe vs. Wade) nearly four decades ago. One of the principle outcomes of the Court’s decision was that abortion was a fundamental right under the United States Constitution. Unfortunately, as we all know, it isn’t that simple. Our government, court system and the public still have to deal with two competing interests; protecting the mother’s rights and her health, and protecting the “potentiality of human life”. This left the gates open for controversy to flood and destroy any possible bridge between the two. It also allowed the State to intervene to determine “fetal viability” and to regulate the procedure. Where do the rights subside? Who has the ultimate right? Were is the right of the physician to practice medicine? What is the constitutional right of the mother? Why is it the right of the State to determine the definition of life or the viability of the fetus? What is the unspoken right of the fetus? Here is the essence of decades of debate. EQUITY of EVIL tells a tale of a new business model that enhances the availability of abortion procedures to those who could not otherwise easily obtain such a procedure… to minimize the back alley and self-induced procedures… to provide a confidential, clean, affordable procedure with less trauma to the mother and the fetus. But regardless of the intentions, things go bad. Man’s burning desire to exploit others for pleasure, greed or personal gain suffocates any positive potential outcome. When this author witnessed the Republican candidate’s desire to overcome Roe vs. Wade, I went back to revisit those passages in EQUITY of EVIL which describe the statistics of abortion in this country. “There are approximately forty-two million unwanted pregnancies annually throughout the world. Forty-three percent of all women will have at least one abortion before they reach the age of forty-five….” What would our world be like if the majority of women suddenly had to find an illegal means of accomplishing these procedures? Those who could afford it would find access through the black markets, those who could not, would revert to their own means. Such is the dark world of EQUITY of EVIL.